The Yeshivah of Flatbush Joel Braverman High School's two Robotics teams recently competed in FIRST Tech Challenge, a region-wide robotics meet. 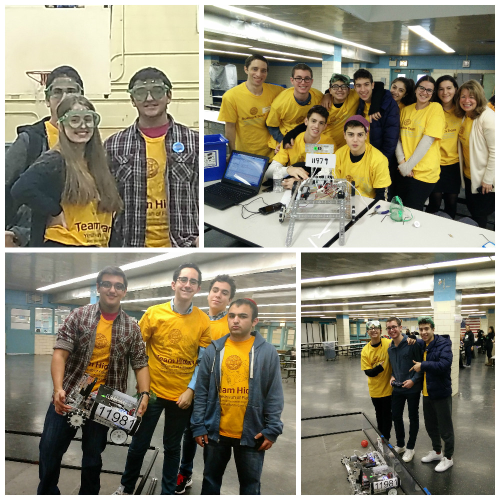 Teams created their own robots which performed automated and driver-controlled tasks for the competition. The Robotics Club-Team Hidary, was led by STEM and Robotics teacher Mr. Shai Horowitz and Robotics Club coordinator Isaac Cohen (HS 2008). In their rookie year, the Flatbush teams finished with impressive rankings of 11th and 13th place out of 20 teams. The Sunday event began with team check-in at 8 AM. The robots were judged on compliance with technical specifications and each team presented their engineering notebooks to a panel of judges. The excitement in the room was palpable as the various teams scrambled in the host school's lunchroom to make last minute adjustments and perform trial runs on the practice field. From 10:30 to 2:30, the competition was on! Team members buzzed around the room with pliers and Allen wrenches to tighten screws and ran to and from outlets to recharge robot batteries to increase their chances of winning. Enthusiastic spectators and fans cheered on the teams. Each of the Flatbush teams won 2 out of 5 matches. Returning to the Yeshivah, the teams began to prepare for the February 19 competition at the Dalton School. This event will be even larger, with 28 teams in the competition. With some experience under their belts, we hope to come home with top rankings!